Moyamoya disease is treated regularly at the University of Florida. 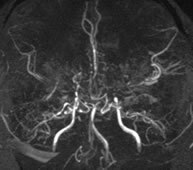 Moyamoya disease is a progressive disease of the proximal cerebral blood vessels. It is characterized by narrowing of the internal carotid artery, middle cerebral artery, and anterior cerebral artery. The condition leads to irreversible blockage of the main blood vessels to the brain as they enter into the skull. Moyamoya tends to affect children, as well as adults in the third to fourth decades of life. Children present with symptoms of stroke, such as weakness of an arm or leg, or seizures. Adults tend to present with ischemic or hemorrhagic stroke. 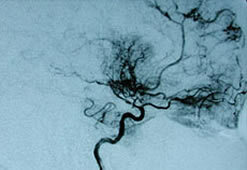 The diagnosis is made by any neuroimaging study that evaluates blood vessels. Formal angiography of the cerebral vessels is the most accurate. CT-angiogram and MR-angiogram can make the diagnosis as well. MRI with diffusion weighting is the best study to evaluate for evidence of strokes. Sometimes nuclear medicine studies such as SPECT (single photon emission computerized tomography) or a DIAMOX nuclear medicine scan are used to demonstrate the decreased blood and oxygen supply to areas of the brain involved with the Moyamoya disease. Direct revascularization (STA to MCA bypass), which involves actually joining the superficial temporal artery to a blood vessel on the surface of the brain (see EC-IC bypass). Indirect revascularization (EDAS procedure); an on-lay revascularization procedure. EDAS involves dissecting out blood vessels on the scalp and laying them directly on the brain to encourage the growth of new vessels.